This the the start of a very valuable jewelry giveaway! Over the next several weeks we will be giving away $4,000 in jewelry! Dixieland Mom and Giveaway Bandit are excited to bring you this awesome designer jewelry giveaway! We’ve teamed up with a great group of bloggers for this event. A huge Thank You to Still Blonde After All These Years, Keenly Kristin, The Lucky Ladybug and The Adventures of J-Man & Miller Bug. Description: Featuring smoky quartz, fluorite, and white oval freshwater pearls, this 18″ single strand “Summer Storm” necklace is like a cooling storm on a hot summer’s day. “Summer Storm” refreshes and renews, you can almost smell the clean scent that lingers after a rain storm, and feel the cool moist that fills the air. Here is your chance to win this gorgeous necklace by jewelry designer Sharon Wei! Her jewelry is sold at fine jewelry stores across the country, and retails from $150-$750. We will be giving away 10 pieces of jewelry, between now and the end of the year, for a total value of $4000.00! Each Giveaway will have it’s own theme, some of those themes include: Wedding, Kids, Fall/Autumn, Nature Lovers, Coffee/Latte/Chocolate Lovers and more! Be sure to come back and enter during each event! Ancient and modern. East and West. Classic and contemporary. It’s not surprising that Sharon Wei is able to capture these diverse elements in her jewelry designs – she is that rare jewelry artist who is steeped in unusually rich and varied cultural experiences and who expresses those experiences in every design. Born in what is now Beijing, China, her childhood was filled with artistic endeavors that fueled her inquisitive spirit and pushed her to explore the larger world. Arriving in the United States after her university studies, she brought her artistic sensibilities to the world of jewelry, gaining several industry certifications along the way. Today, every piece of Sharon Wei’s jewelry expresses her adventurous cross–cultural experience and excitement about the possibilities of the moment. 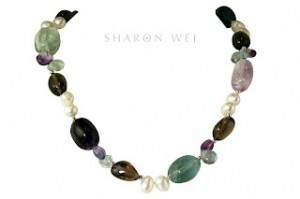 Sharon Wei captures in classic and contemporary designs the beauty, complexity, and unique qualities of every woman. She combines the tradition of her native ancient Chinese culture with the fashion forward western styling in a way no other designer can. Her use of freshwater pearls from China as the foundation for her designs is an homage to her native culture, and her direct and personal relationship with the best Chinese pearl farms gives her hand–picked access to a wide variety of the highest quality pearls. The result is a fresh interpretation of pearl jewelry design that fits perfectly into the modern American wardrobe. 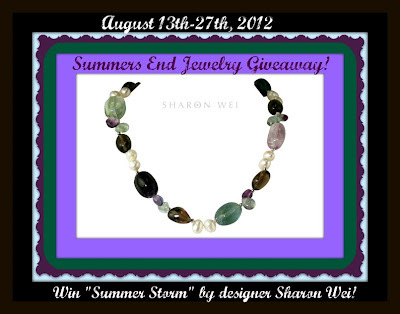 Check out some of these gorgeous designs offered by Sharon Wei Designs on Facebook! Entry is simple, just enter on the Rafflecopter below. This giveaway is open to residents of the U.S, 18 years of age and older. Giveaway ends on August 26th at 11:59 pm EST. Wow! I am so excited. I want to win those lovely jewelries.